Wild oregano (Origanum vulgare) is a herb that is rich in the phenolic compound carvacrol and is characterised by a strong, bitter taste producing a slightly burning sensation in the mouth. The essential oil of the varieties of wild oregano mainly consists of carvacrol, followed by its precursors p-cymene en gamma-terpinene. Wild oregano oil is standardised at min. 70% carvacrol and max. 0.5% thymol. For many applications, thymol is less effective than carvacrol and, in contrast with carvacrol, can be irritating to the skin. Most important characteristics of Wild oregano oil: Double standardised extract of wild oregano oil with a high carvacrol content (min. 70%) Contains only a small amount of thymol (max. 0.5%), which, in many applications, is less effective than carvacrol Standardised extract, the best guarantee for continuity in efficacy In a base of cold-pressed extra virgin olive oil, which aids absorption Directions: Take 1 capsule daily, during or immediately after a meal. Warnin Do not use when pregnant or breastfeeding. Interactions with regular medication and other health products may occur. Please consult an expert about this. 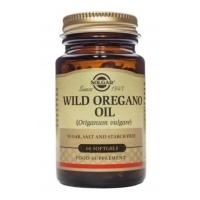 Contains per capsule: Wild oregano oil (standardised at min. 70% carvacrol, max. 0,5% thymol) – 25 mg – of which carvacrol 17.5 mg In a base of 158 mg Medium Chain Triglycerides (50-65% C8 and 30-45% C10). Excipients: glycerine, gelatine Guaranteed to contain no: GMO, maize, soy, yeast, gluten, lactose, added saccharose, preservatives, artificial colouring and flavouring agents, artificial odours. 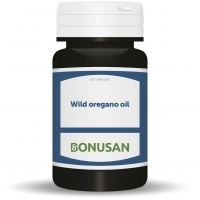 Posted on March 10, 2019 by Shaun OConnor in Approved Vitamins and tagged Approved Vitamins, Bonusan, Wild Oregano Oil 60's. Posted on March 10, 2019 by Shaun OConnor in Approved Vitamins and tagged Approved Vitamins, Solgar, Wild Oregano Oil 60's.